Kiva hasn’t announced customers since Amazon bought it. If you opt to do your holiday shopping on Amazon.com, odds are good that the merchandise you order will be plucked from a shelf by a human: The Seattle e-commerce giant is adding 70,000 seasonal workers in its distribution centers for the Christmas crunch. But Amazon is also beginning to add Massachusetts-made robots. In October, the company divulged for the first time that it has deployed more than 1,300 robotic warehouse workers from Kiva Systems in North Reading, a company Amazon bought last year for $775 million. 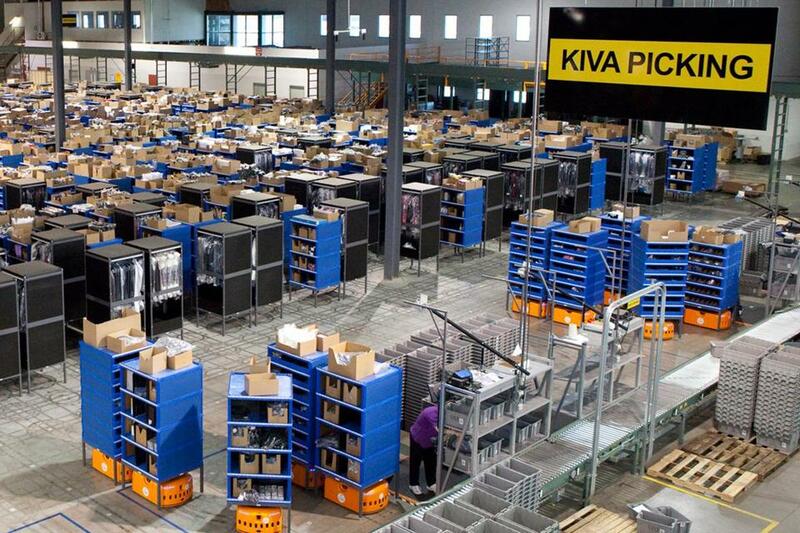 And Kiva’s squat orange robots, which move racks of merchandise to workers who fill boxes, could prove essential to helping Amazon return to profitability. In 2012, Amazon lost $39 million, and it lost $41 million in the most recent quarter. But as Kiva ramps up production of its robotic systems for its new parent — the number on order from Amazon may be as high as 18,000, according to one trade publication, and could be higher according to my sources — the big question is what happens to Kiva’s early customers. Major retailers such as Staples, Walgreens, Gap, Office Depot, and Crate & Barrel installed Kiva’s technology in their warehouses. And now they all must grapple not only with possible shortages of Kiva bots, but also whether they want to do business with a direct competitor. Kiva is a unique Massachusetts success story. The company was founded in Silicon Valley in 2003 by a tech executive who previously worked at Apple and WebVan, a dot-com-era grocery delivery venture that flopped. Mick Mountz moved the fledgling company to Massachusetts to tap into the robotics engineering talent here and be close to Boston-based Bain Capital, which supplied early funding. Bain also helped make an introduction to Staples, another company it had backed. I got the chance to try Kiva’s system. While I stood at a packing station, a fleet of ottoman-size robots carried tall metal racks of merchandise to me, following bar codes printed on the concrete floor to find their way. A red laser pointed to the item I was supposed to grab. When I placed it in a cardboard box and hit a button, that robot drove off and a new rack showed up. Kiva dubbed this the “magic shelf” — items simply materializing in front of you, no walking required. The robot didn’t replace humans, but it made them far more efficient. Amazon was always Kiva’s white whale: Though the e-tailer acquired a couple companies that used Kiva technology, like Diapers.com, it never became a customer itself. Then, in March 2012, in the second-biggest acquisition in its history, Amazon bought Kiva outright. Since then, Kiva has fallen under Amazon’s cone of silence. Press releases have all but stopped. No one at Kiva or Amazon would comment for this story. But the impression is that Kiva’s interest in selling to non-Amazon customers has waned. The company hasn’t announced a new customer since it became part of Amazon, and much of its sales staff has departed. The company continues to hire — but in departments like engineering and manufacturing, not sales or marketing. It could be that satisfying Amazon’s appetite for Kiva bots is consuming most of the company’s resources. And many people in robotics aren’t surprised. “Amazon is so big that if Kiva’s technology can help them be more efficient, and add one percent to their gross margin, then that $775 million price tag might be cheap,” says John Kawola, chief executive of Harvest Automation, a North Billerica maker of agricultural robots. John Lert, a Wakefield robotics entrepreneur, says that for Amazon, which operates more than 40 fulfillment centers around North America, “it was cheaper to buy the company than pay Kiva a license fee for the technology.” Amazon initially pilot-tested Kiva’s technology in Seattle and has since rolled it out to two other locations. The story of Kiva may turn out to be that it radically improves Amazon’s order-filling efficiency. But Kiva’s earliest supporters invested in the technology hoping for that same efficiency boost — and now find themselves being forced to either buy the technology from a rival, or shift to another supplier. Lert says there aren’t any warehouse systems closely comparable to Kiva, though companies like Dematic and Swisslog sell somewhat similar technology. I called every customer that Kiva had announced prior to the Amazon acquisition, but none wanted to comment on the record, beyond confirming that they use Kiva robots in their warehouses.